So there's a new Ghostbusters film coming out. Which of course means there's new Ghostbusters toys. Which thankfully means there's new ghost mini figures! 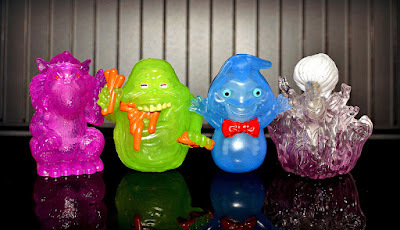 I'm a big fan of the mini ghosts from Kenner's '80s-'90s The Real Ghostbusters line -- so much so that I set out to complete a whole set of them -- so naturally these new ghosts piqued my interest. They're called Ecto Minis, they're made by Mattel, and instead of coming packed with normal size action figures, they're sold on their own. Honestly, after seeing photos online and reading some collectors' thoughts on them, I wasn't sure I wanted to buy them. Of course, that all changed when I actually saw them in the store. Who was I kidding, thinking I'd be able to pass up new Ghostbusters minis? 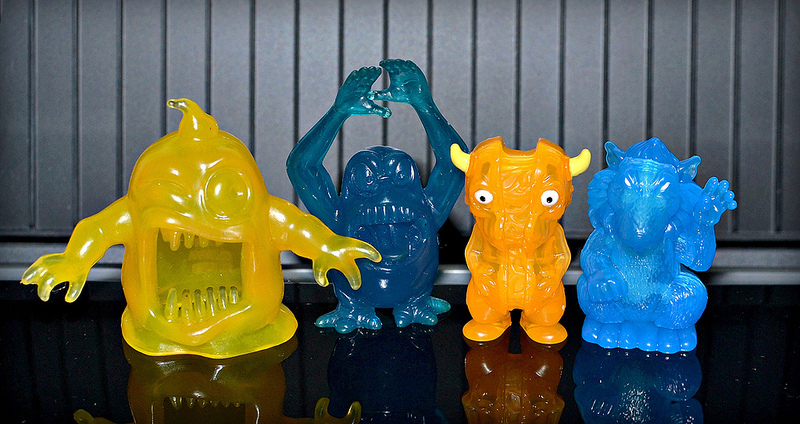 Let's take a closer look at these new ghostly chunks of plastic. 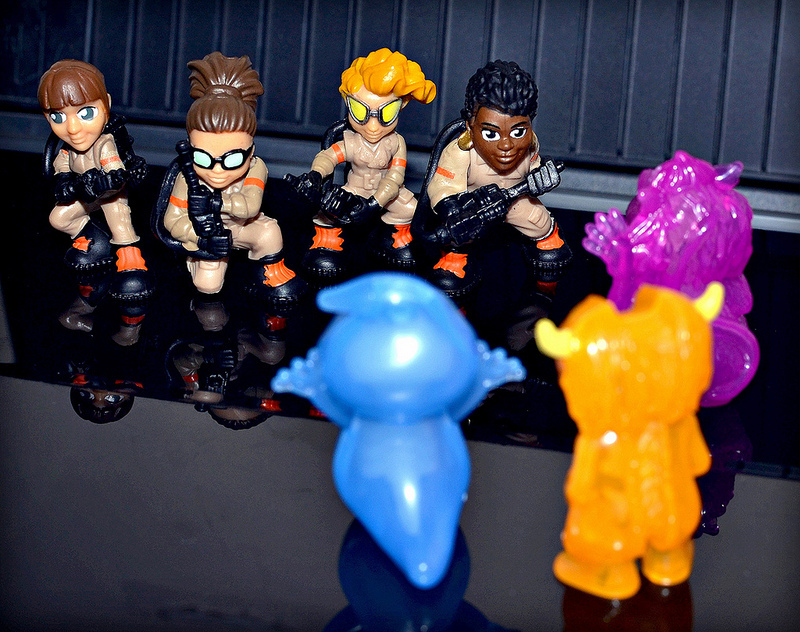 Note that there are several human character Ecto Minis as well, but here we'll focus mainly on the ghosts. There are a few other new movie ghost minis not shown here, like Ms. Slimer (available in a Slime set) and a Subway ghost (available in a Trap playset). 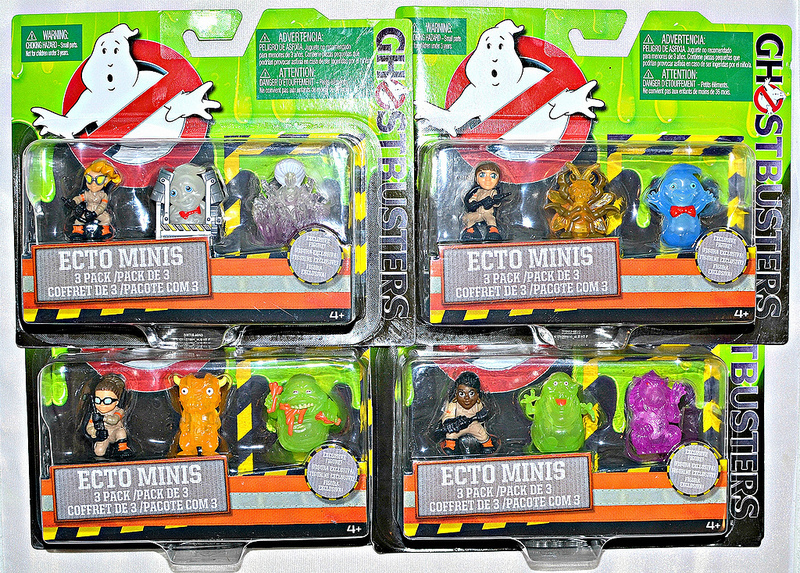 In addition, there are "Classic" Ecto Minis that feature characters from the original '80s film. As far as I know, these are only available in blind bag single packs. 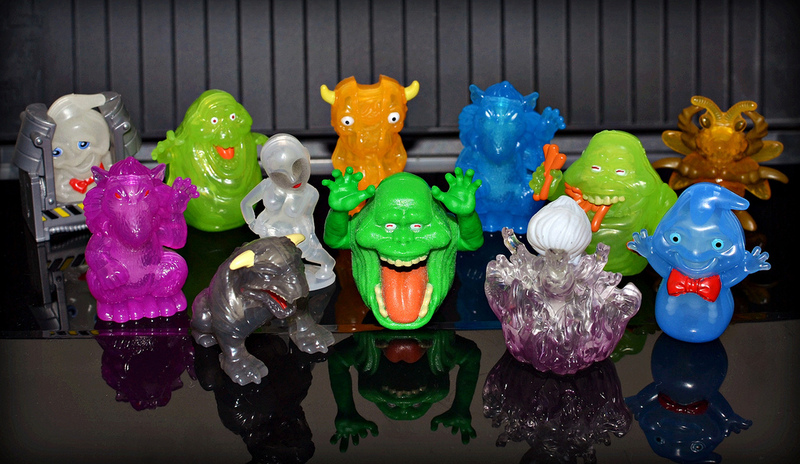 The ghosts in this set include clear and solid versions of Slimer and clear and solid versions of a Terror Dog. 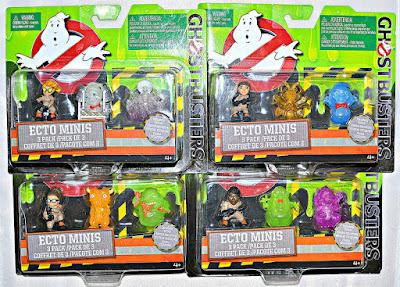 So far I've only seen Ecto Minis at Wal-Mart. I'm not sure where else they might be available. Ecto Minis are about 1.5 inches tall, give or take a bit depending on the figure. That's actually a bit smaller than I thought they'd be after seeing photos online, which is a good thing as it actually enhances their appeal. The sculpting is nicely done, on both the ghosts and human figures. Some figures are better than others, but they all have something interesting about them. A really fun feature is that all of the clear ghosts have little glow-in-the-dark skeletons inside them, which gives them a cooler look, even when the lights are on and they're not glowing. I think my favorite sculpts are the two female ghosts -- the Mannequin Ghost and Gertrude Eldridge (which some have also called the Library Ghost, but I'm not sure if there's a difference between the two) -- because they are the most unusual-looking. 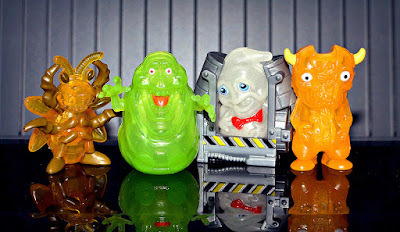 It's also nice to finally have some good Slimer mini figures, something that the vintage Real Ghostbusters line failed to deliver. Unfortunately, the skeleton feature comes with a trade-off. 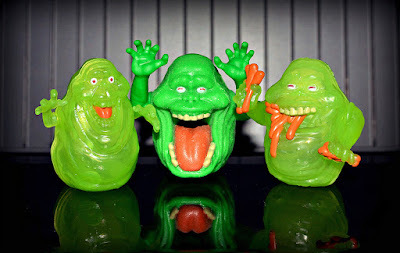 The ghost figures are made of a light hard plastic, and are very hollow inside except for their skeletons. This gives them a bit of a cheap feel, and a look that brings attention to the fact that they're made of two halves put together. I'd much prefer for them to be made of a nice hard rubber / soft plastic that wasn't hollow, although I'm not sure if it would have been possible to mold the skeletons in them that way. 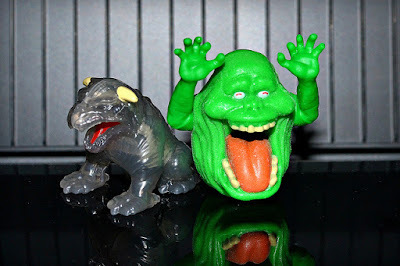 Ecto Minis are really fun, and I'm glad to have them. 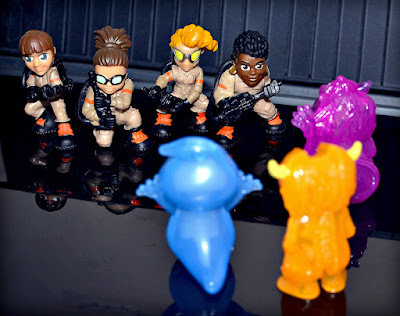 If you're a Ghostbusters collector or a fan of mini figures (particularly vintage Ghostbusters minis), you'll almost certainly be able to find something to love about them. The hollow, lightweight hard plastic leaves something to be desired, but once I finally saw these figures in person it wasn't a deal-breaker. They're also pretty pricey -- around $3 per single figure blind bag and $10 per three-pack (why do the three-packs cost more per figure than the blind bags?) -- but I guess that's par for the course these days. What do you think? 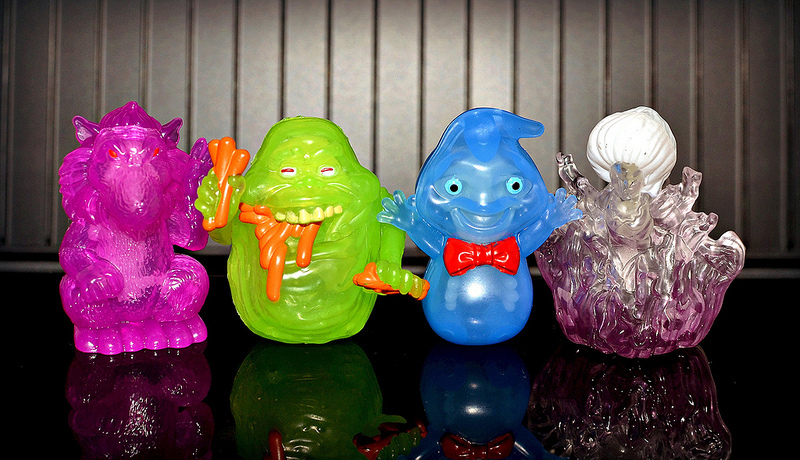 Have you picked up any Ecto Minis or do you plan to collect them? I foresee this movie costing me a lot of money in the long term. The slime sets are outrages at $10 each with some slime and only 1 minifigure! The blind bags are okay, but I agree, the hollow plastic does look cheap. As cool as the glowing indoskeletons are, they're kind of hard to see even when glowing. But, it is nice to have a minifigure version of Slimer. There are some good sized action figures for $10 (Mayhem, Staypuft, and Rowan) but I haven't be able to find any. Scalpers are clearing the shelves and selling them on eBay. I am a completist so I'm tempted to buy the Slimes and playsets to have all the minis...but not at those prices. I'm hoping they'll eventually end up on clearance. I snagged a few from target, so no walmart exclusives. The ghost didn't feel as cheap as I thought they would, but would have loved if there were just solid plastic. Hate that the ghost rat is used twice, I think it is the most "blah" design. That split ghost in purple would have looked awesome. I can't wait to get my hands on the trap play set and I hope the board game will make it to clearance too. Looks like it has a solid Rowan figure. and the pawns look like what the female Gbs would have looked like as mono minis. Yeah I wonder what made them decide to use the rat ghost twice. This is the first time I am seeing the board game. The minis that come with it looks pretty nice. I love this page. Thanks for the info even though I am a little late to the collecting thing. My six year old son is obsessed with Ghostbusters and you should have seen all of his presents for Christmas. I have looked forever to see what was the mystery pack figure and it is that night terror dog. My son kept saying it can't be because he wasn't in the new one but I just showed him this page and now we have to find that and Slimer with the hotdogs. I need to buy one more three pack. For Christmas, I bought him 32 blind bags (I got them for .90 cents at Kroger!) And he has like 5 of the same ones and has 12 from them. This page has helped me a lot to find the rest of them and I am glad I finally found a page like this!! Now going to ebay to find the rest and spend more money I guess. Lol. This Ghostbusters stuff can get expensive! Glad you found it helpful! That's awesome of you to try to track them all down for your son. Good luck!